One of the three former San Luis Obispo High School students accused of setting the school’s computer lab on fire is back in jail. For the second time in a period of eight days, San Luis Obispo police arrested Jacob Ruth, 19. Ruth is now accused of setting multiple fires at the school from which he recently graduated. Shortly after midnight on Dec. 8, firefighters responded to a fire alarm at the computer lab on the SLO High campus. Firefighters quickly extinguished the blaze, but the fire destroyed the lab, causing about $750,000 in damage and wrecking the robotics equipment that students had been building in the lead-up to a competition. 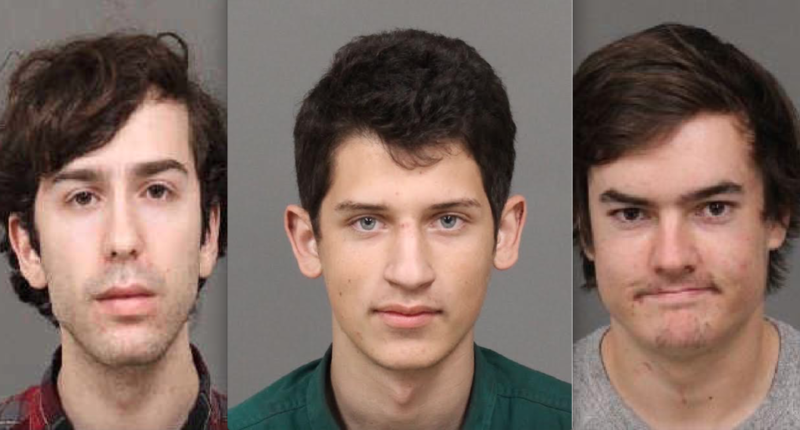 After receiving a call about three men jumping a fence near the location of the fire, police arrested Ruth, as well as Michael Benadiba, 18, and Cameron Bratcher, 18. Benadiba and Bratcher had transferred out of SLO High last year. The three suspects allegedly confessed to police that they set the computer lab on fire because they were angry with a former teacher. Officers charged all three suspects with felony arson, burglary and vandalism. Each of the suspects bailed out of jail following their arrests. On Dec. 16, police again arrested Ruth on charges of burglary and arson. He has since remained in custody with his bail set at $500,000, according to the county sheriff’s office website. KSBY reports that a criminal complaint filed against Ruth states he burglarized a classroom and concession stand at SLO High at some point between Dec. 3 and Dec. 6. Ruth also started a fire at the school some time between Dec. 3 and Dec. 5, prosecutors allege. The San Luis Obispo County District Attorney’s Office has yet to file charges over the fire that destroyed the computer lab. Prosecutors are still reviewing the incident. Dude. One side will want to understand what the fu@k you are thinking, but you know what, how bout we just lock you the fu@k up and protect society at large. He should have to remove all that damaged building matierials and work all day and night to fix it. Let him carry sheets of drywall around, jackhammer and clean it all up. Never happen. and have to face his peers who should be pissed off at him for torching their school! I hope these people are held accountable and not just a slap on wrist. Should pay for all damages but that will never happen. Unfortunately the youth of today ( not all ) do not have a concept of honor and what is right and wrong. I know what my dad would of done to me if I did this and I would of deserved it. The old school rules not popular today seemed to work even though they may seem harsh now. I agree with you. However, consider the liberal state and justice system we live in. It is unlikely they will be held accountable as in the old days, and there are still many who believe they were not so harsh. This guy needs some serious pharmaceutical long term help. It not a far throw to think that the next place torched may one day have people. Gee, I’m sure these young folks are just mis-understood snowflakes, give them all participation trophies, arrange a support group let them go and all should be fine. You’re probable right. It sad to say so. Dear local drug dealers. Please stop selling to this clown. Consider it a public service.